The nature and role of paid foreign forces have altered considerably in the late twentieth century. ‘Military companies’ – private firms providing active military assistance, in some cases involving combat – have exploited the increasing reluctance of Western governments and multilateral organizations to intervene directly in civil conflicts. As a result, their influence has increased. David Shearer argues that the debate over the use of these companies – notably the South African firm Executive Outcomes (EO) – has not, however, kept pace with their development. Companies such as EO are widely seen as merely modern-day mercenary outfits exploiting violence for private gain. 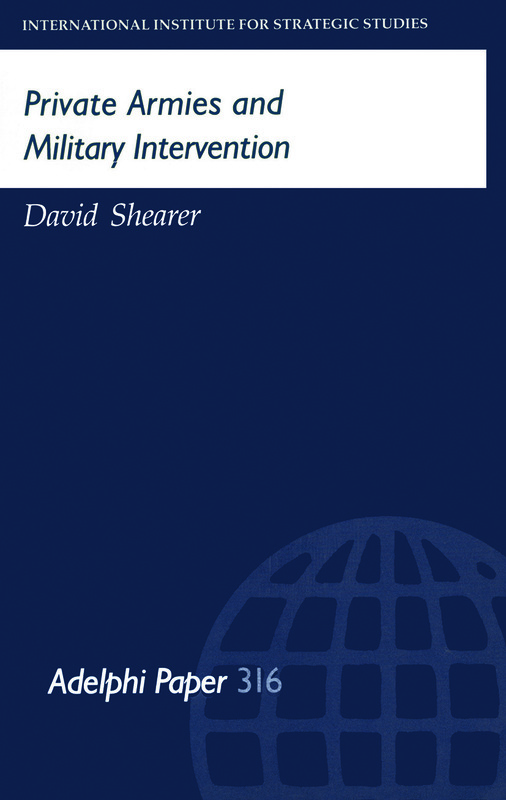 Shearer contends that the need to recast the debate on military companies is urgent. These companies are not a passing phenomenon; if anything, their influence and activities are set to increase in the next century as Western military retrenchment continues. Efforts to restrict the activities of military companies by drafting international or domestic legislation have to date been ineffective, and are likely to remain so. This paper – the first detailed analysis of the private military sector – argues that dismissing it as an unpleasant aberration is misleading and unhelpful. Military companies can claim success in achieving immediate strategic objectives. The author cites two examples at length – EO’s operations in Angola in 1993–94, and in Sierra Leone in 1995–96 – and suggests that military force can stabilize a crisis. Engagement with military companies may create possibilities for them to complement international and regional peacekeeping efforts. Traditional UN peacekeeping is flawed in terms of its speed of mobilization and lines of authority, and is hampered by interference from contributing countries. The private sector may avoid many of these difficulties. Private Armies and Military Intervention concludes that transparency of operations and business relationships is a crucial first step towards ensuring the accountability of the private military sector. However, a coherent policy towards military companies has yet to be formulated. Current frameworks under international law are insufficient and inappropriate. Characterizing the activities of military companies as ‘mercenary’ offers few useful means to tackle the issue within a framework of international policy. What is required is a more pragmatic approach that assesses the effectiveness of – and engages with – private armies.